(MoneyWatch) With car owners trying to keep gas costs from busting their budget and federal rules compelling higher mileage ratings, automakers add more hybrid, electric-powered and diesel vehicles with every new model year. For 2014, mileage-boosting offerings include a new Honda Accord hybrid rated for 50 MPG in city driving, an all-electric Chevrolet Spark and even a new Jeep Grand Cherokee diesel. The changes in autos are coming more swiftly than many consumers realize, said senior editor John O'Dell, who follows "green" cars for automotive website Edmunds.com. "Even if you think you're not really interested in new technologies for improved fuel efficiency, it's likely that a car or truck with some type of electric drive or alternative fuel will wind up on your consideration list the next time you shop for a vehicle," he said. In the past, consumer interest in these more fuel-efficient autos focused on cars like the Toyota Prius hybrids, Nissan Leaf all-electric vehicle and the Chevrolet Volt electric, which comes with a gas-engine backup to extend its range. But O'Dell said automakers are planning more than 40 new conventional, hybrids, plug-in hybrids and diesel-powered cars between the 2013 and 2015 model years. Honda Accord Hybrid. Scheduled to go on sale on Halloween, this new hybrid is unlikely to scare anyone but the competition. Its EPA rating of 50 MPG tops the 47 MPG for the Ford Fusion Hybrid, while both have 47 MPG combined city/highway ratings. (Only mileage champ Toyota Prius has higher ratings, with 51 MPG city and 50 combined.) The Accord Hybrid adds some standard safety equipment, including blind-spot warning and a rearview camera. Prices will start at $29,155 and range up to $34,905 for the loaded Touring model. Chevrolet Spark Electric. This small, easy-to-park car designed for city driving is getting an all-electric version. Edmunds's O'Dell points out that this is General Motors' first all-electric vehicle since the EV1 was discontinued in 2003 after GM concluded it could not sell it profitably. The Spark is powered by a 130-horsepower electric motor that provides quick acceleration, and its battery has a range of 80 miles before recharging, according to Chevrolet. It is rated at the equivalent of 119 MPG in combined driving based on an EPA formula. To be sold initially in California and a few other states with similar zero-emission air pollution regulations, the Spark Electric is expected to be priced around $32,000. Hyundai Sonata Plug-in Hybrid. The South Korean company will add a plug-in version of its popular Sonata Hybrid by mid-2014. O'Dell expects that a larger battery pack will permit greater electric-only driving range, and thus better mileage, for the plug-in than the regular hybrid. He estimates the plug-in price to be around $30,000. Cadillac ELR. The Chevy Volt powertrain goes upscale for 2014 and gets a sleek new exterior and luxury interior as a Cadillac coupe. 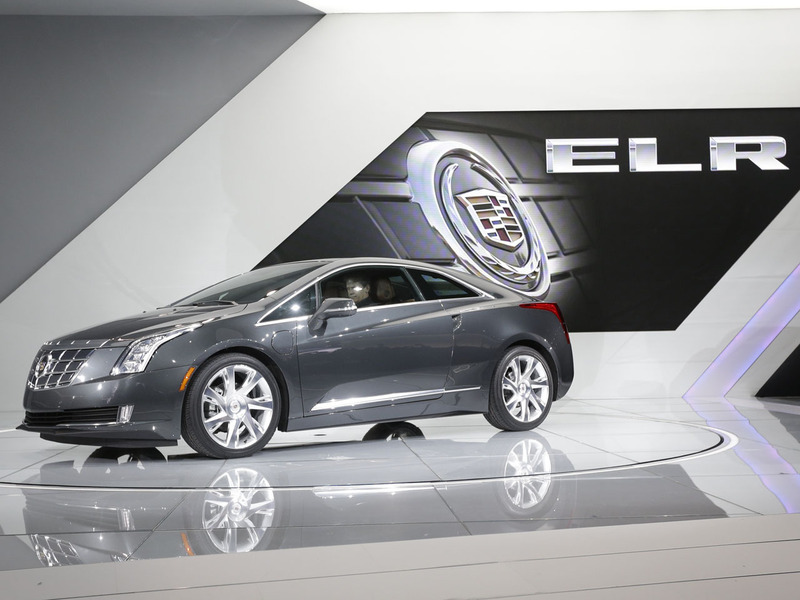 GM chief executive Dan Ackerson has said the ELR is a first step toward competing with Tesla, the producer of high-end electric cars. GM has not yet announced the ELR's pricing, but published reports put it below the $57,400 price tag for the Tesla Model S.
Tesla Model S. Speaking of Tesla, the company is bringing out next year the first all-electric SUV crossover, the Model X. The X offers an optional dual-engine all-wheel drive. With the dual engines, the company claims the X will go from zero to 60 in under five seconds, acceleration more like a sports car than an SUV. The rear doors will open vertically for easier access to the back seat. Tesla has not yet announced pricing, but analyst estimates have it starting in the $60,000 to $70,000 range. Jeep Grand Cherokee Diesel. In addition to hybrids, plug-ins and all-electrics, manufacturers are offering diesel engines to improve mileage, especially on the highway. Jeep's redesigned Grand Cherokee includes that option. On the four-wheel drive version, the mileage doesn't sound that high initially at 21 MPG in city driving and 29 on the highway. But compare that to an equivalent gasoline V-8 Grand Cherokee -- 14 MPG city and 20 highway. The diesel option does not come cheap, however. It adds $4,500 to the already lofty price of the top three versions of the Grand Cherokee. Those range from $36,790 for the Limited to $51,990 for the Summit. If these choices don't meet your needs, you also have the option of gas engines with much-improved mileage. And with each passing year shoppers will find higher-MPG cars on offer.